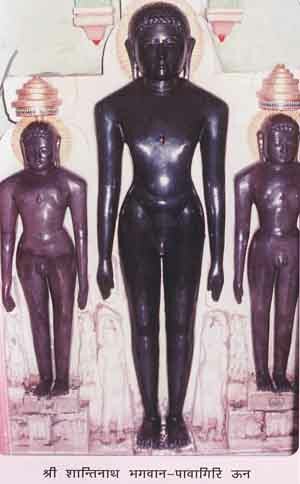 Sri Shanthinath Bhagwan in a standing posture, of height approx. 12 feet in a shrine located in a small hill on the shore of River Chirud, which is near the village of Unn. (Dig). According to the Digamber belief, Pavagiri Siddhakshetra described in “Nirvana Kand,” from where Swarna Bhadra with a few Munis during the period of Sri Chandraprabhu Bhagwan attained Moksha from Pavagiri, which is on the banks of the river Chelna. Pavagiri of yester years is Unn today and the nearby river called Chelna today should be River Chirud of yester years. A lot of ancient idols discovered from earth at various places over here talks about the antiquity of the place. 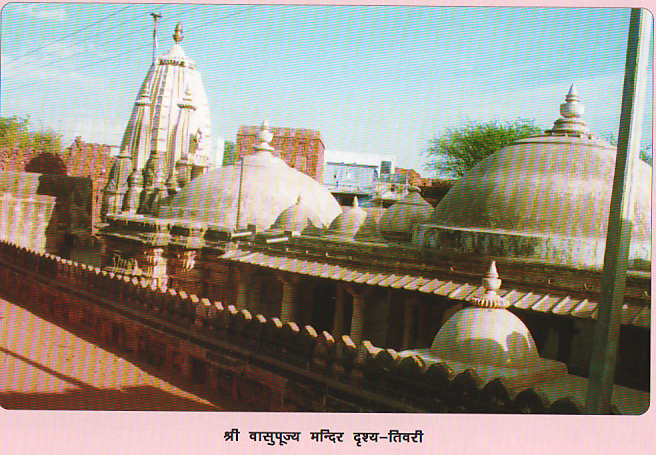 It is said that this temple was constructed by King Ballal in the 12th century. On the Presiding Deity of this temple, Sri Shanthinath Bhagwan, it is inscribed that the idol was sanctified in the presence of Acharya Sri Yashkirti on Jyest Krishna 13 in Vikram year 1263. The temple belongs of the period earlier than that. It is said that this is one of the temples out of the 99 temples constructed by King Ballal. The temple was first renovated in the year 1935-40 and again in 1994 as is told. At this place while digging for the foundation of a dharamshala, the idol of Sri Sambhavnath Bhagwan and foot prints were discovered. There is an inscription found on the idol stating Vikram year 1218. “Acharya Sri Prabhachandrapranmathi Nithayen, Samvat 1252 MaghKrishna 5, Ravi Chaitra Kuntavave Sadhu Balahu Baraya Salah Thathah Mandodari Suth Golaha Ratan Malo Ki Pranmathi Nithayan”. The antiquity of this place is clearly evident from the above. According to the Digamber belief, this is the place from where Swarnabhadra along with a few saints attained moksha during the period of Sri Chandraprabhu Bhagwan. Thus Pavagiri Siddhakshetra described in “Nirvan Kand” is believed to be of this place, and that is the significance of Unn village. The specimens found in the ancient temples and the idols that are continuously discovered under the earth, remind one of the antiquities of the place and also implies how prosperous this place was then. The idol of Sri Mahavir Prabhu which manifested with miraculous incident is charming and miracle working. Thus this place comes under Siddhakshetra, Atishayakshetra (miraculous), Purathankshetra (ancient) and Kalakshetra (artistic) too. The art and architecture in the ancient temples over here reminds one, of the art in the temples of Abu Dilwara and Khajuraho etc. Besides this, there are five more temples in the mountain and a temple in the premises of the dharamshala. This place is situated on Khandwa-Baroda National Highway 26. Khandwa is a distance of 103 Kms, Indore 160 Kms, Talanpur 110 Kms, Siddhavarkut 112 Kms and Bavangajaji at a distance of 78 Kms. Conveyance is available from all these places. Dharamshala is close to the bus stand. Cars and buses can go upto the temple. The nearest airport is Indore. For lodging there is a dharamshala with all facilities including that of a bhojanshala for meals. P.O. Unn – 451 440.